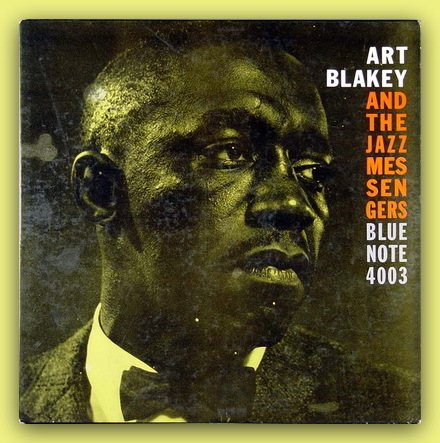 ART BLAKEY AND THE JAZZ MESSENGERS – "MOANIN"
This was Blakey’s first album for Blue Note in several years, after a period of recording for a miscellany of labels, and marked both a homecoming and a fresh start. Originally the LP was self-titled, but the instant popularity of the bluesy opening track «Moanin'» (by pianist Bobby Timmons) led to its becoming known by that title. The rest of the originals are by saxophonist Benny Golson (who wasn’t with the Jazz Messengers for very long, this being the only American album on which he is featured). «Are You Real?» is a propulsive thirty-two-bar piece with a four-bar tag, featuring strong two-part writing for Golson and trumpeter Lee Morgan; «Along Came Betty» is a more lyrical, long-lined piece, almost serving as the album’s ballad. «The Drum Thunder Suite» is a feature for Blakey, in three movements, or themes: «Drum Thunder»; «Cry a Blue Tear» (with a Latin feel); and «Harlem’s Disciples». «Blues March» calls on the feeling of the New Orleans marching bands, and the album finishes on its only standard, an unusually brisk reading of «Come Rain or Come Shine». Of the originals on the album, all but the «Drum Thunder Suite» became staples of the Messengers book, even after Timmons and Golson were gone. The album stands as one of the archetypal hard bop albums of the era, for the intensity of Blakey’s drumming and the work of Morgan, Golson and Timmons, and for its combination of old-fashioned gospel and blues influences with a sophisticated modern jazz sensibility. The album was identified by Scott Yanow in his Allmusic essay «Hard Bop» as one of the 17 Essential Hard Bop Recordings. A vocalese version of «Moanin'» was later written by Jon Hendricks, and recorded by Lambert, Hendricks and Ross, as well as jazz vocalist Bill Henderson. Recorded 30 October 1958 by Rudy Van Gelder. All songs by Benny Golson except where indicated.